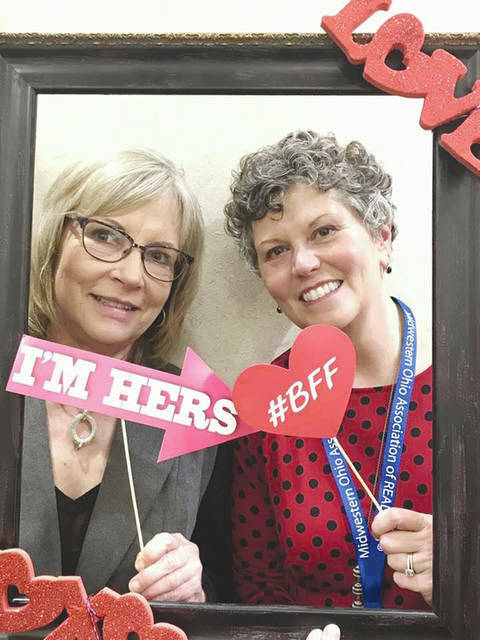 Provided photo Ann Welch and Sue Parker of Troy take a selfie in the #ShareTheLove photo booth during a fundraiser on Feb. 7 at Harris Jeweler. TROY — On Feb. 7 at Harris Jeweler, people came into #ShareTheLove for First Place Food Pantry of Troy. The event, sponsored by Harris Jeweler and LoanDepot of Troy, aimed to raise funds for First Place Food Pantry, with a portion of all sales benefitting the food pantry. The biggest hit of the night was the new Harris Jeweler “Bling Machine” where party-goers could purchase a token for $5, which gave them a “whirl” on the machine. The machine houses 1,000 “gem balls” where everyone wins a gemstone with up to a $1,000 value. One hundred percent of the proceeds from the Bling Machine are donated to First Place Food Pantry. Also set up was a #ShareTheLove photo booth. All party-goers who took a selfie and posted it to their Facebook page with #ShareTheLove are entered to win one of five free whirls on the Bling Machine. Community members may stop into Harris Jeweler between now and March 7 to take a selfie and be entered to win. For anyone still wanting to help raise funds, the proceeds from the Bling Machine will be donated for the entire month of February and anyone who mentions the event at checkout, Harris Jeweler will donate to the First Place Food Pantry through March 7.
https://www.dailycall.com/wp-content/uploads/sites/30/2019/02/web1_ann-welch-and-sue-parker-of-troy.jpgProvided photo Ann Welch and Sue Parker of Troy take a selfie in the #ShareTheLove photo booth during a fundraiser on Feb. 7 at Harris Jeweler.